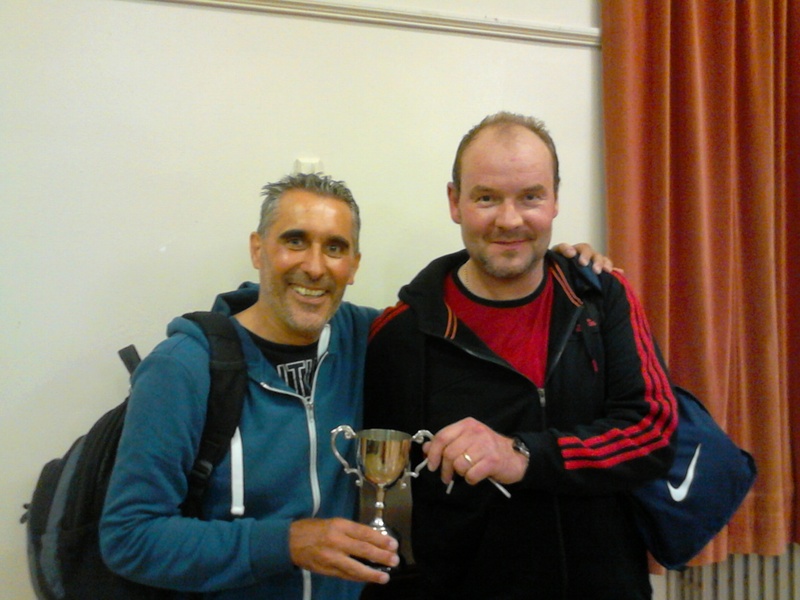 Robert Brown celebrated his recent promotion to the Swots by helping (or carrying) Nick Shepherd to St Andrews Table Tennis Club’s early season silverware. 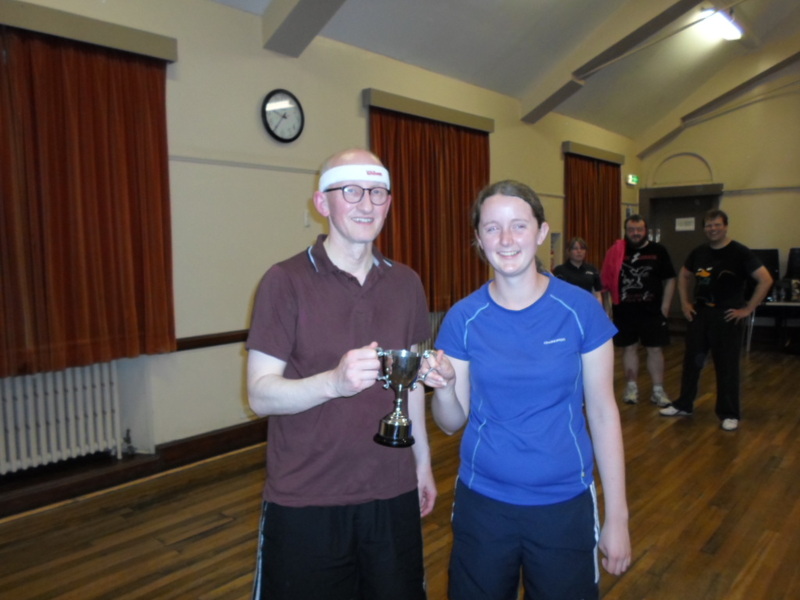 Victory Memorial Hall was looking resplendent on a hot and steamy Monday night when the club rolled out it’s new Awards for All funded court surrounds for the annual Eglinton Trophy tournament. Twelve players entered the competition and they were divided “randomly” into six teams of two by tournament organiser Elaine Forbes. 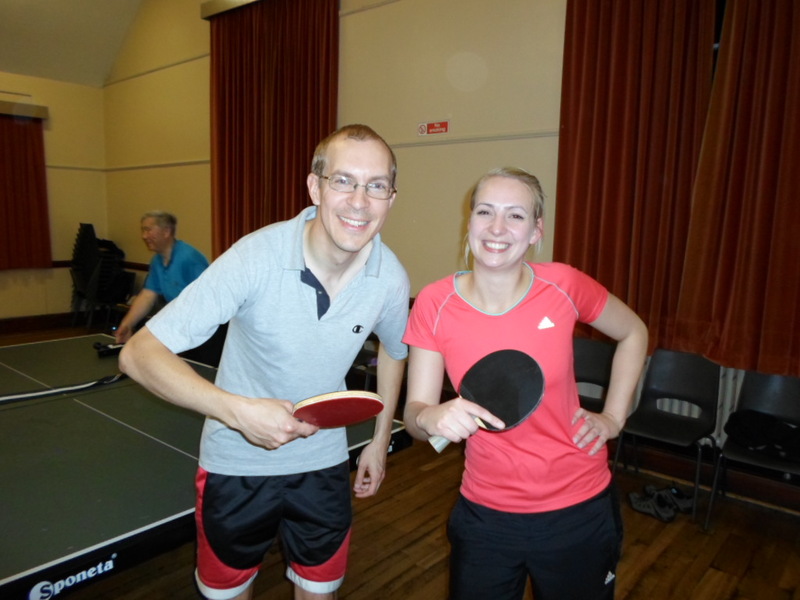 The format was a round robin in which each team played singles and a doubles match against every other team. 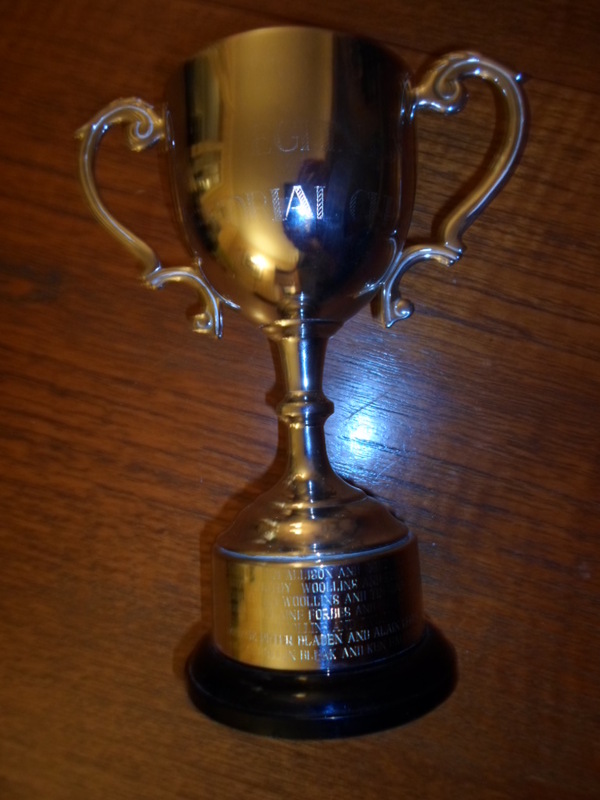 To level the playing field, players were given a handicap for each match (an account of the history of the tournament can be found on the Eglinton Cup page). The ability span in the club has narrowed somewhat in the last year (i.e. the duffers are catching up) and it was no surprise that the competition was fierce and closely contested. New recruit Sandy Pearson showed early promise in partnership with Ian Smith. Using his powerful top spin strokes from both backhand and forehand, he whitewashed Howard Lee 21-0 though a generous handicap of 15 points gave Sandy a strong advantage. Alas, Sandy’s great start was shattered during the doubles match. 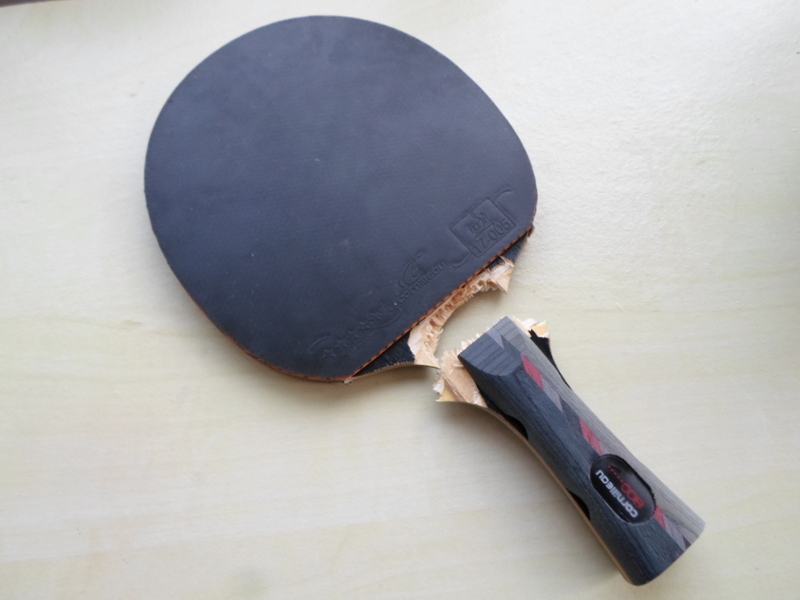 As Sandy swung his bat to play another mighty forehand, his partner Ian was too slow to move out of the way, and Sandy’s bat collided with Ian’s gluteus maximus. The force of the impact was so great that the bat broke into two pieces and Sandy’s wrist was left sore and damaged (though Ian’s backside was remarkably unscathed). Sandy carried on bravely using a reserve bat though this calamity was undoubtedly a blow to his performance. As the competition entered its final phase, there were still a few teams in with a chance of winning the trophy. Peter Bladen and Collin Bleak needed a 4-1 win over Girls Aloud in the form of Emma Bissett and Emily Howat, but they just missed out 2-3. 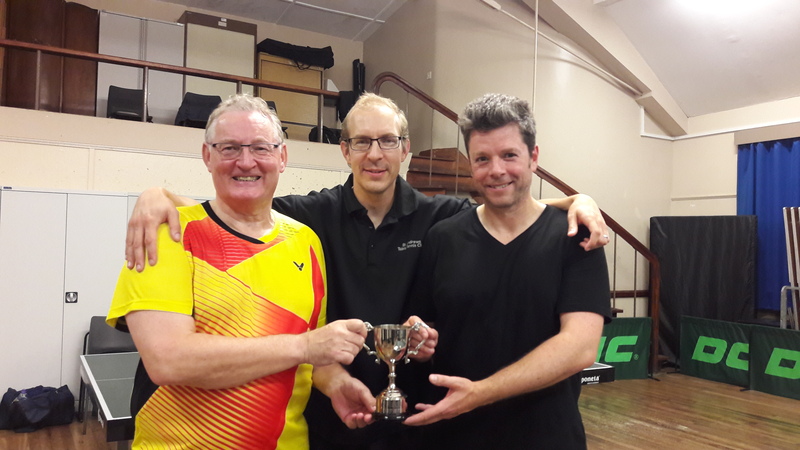 Nick and Robert also lost their last match 2-3 to Ken Falconer and Dave Beveridge, but they had done enough earlier in the night to put their names on the Eglinton Cup by the narrowest of margins. 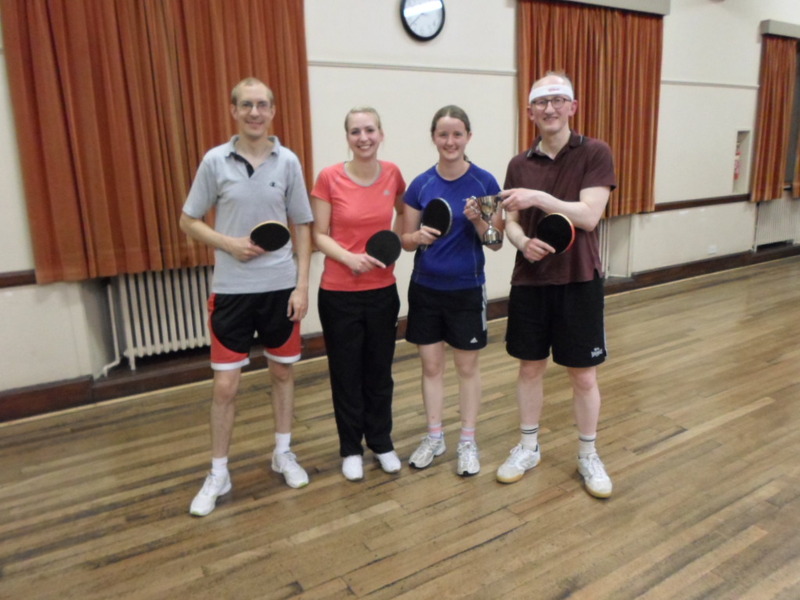 Emma, Robert and Collin led the individual results table with 7 wins each, followed by Nick, Ken Dave and Howard Lee, who each managed five. The club is now looking forward to the start of the Dundee and District leagues on 15th September. New Kids will be hoping at least to consolidate their position as a Division 1 outfit, while Prefects will battle it out again in Division 2. With little between Swots and Prospects the derby matches in Division 3 will likely decide who does best in Division 3. Bring it on. The club’s youth coaching also starts again on 15 September at 5:15pm in the Victory Memorial Hall, St Andrews. The club is still keen to add to the number of youths in its coaching programme. Contact Howard Lee on 01334 828694 for more details or just come along on the first night. 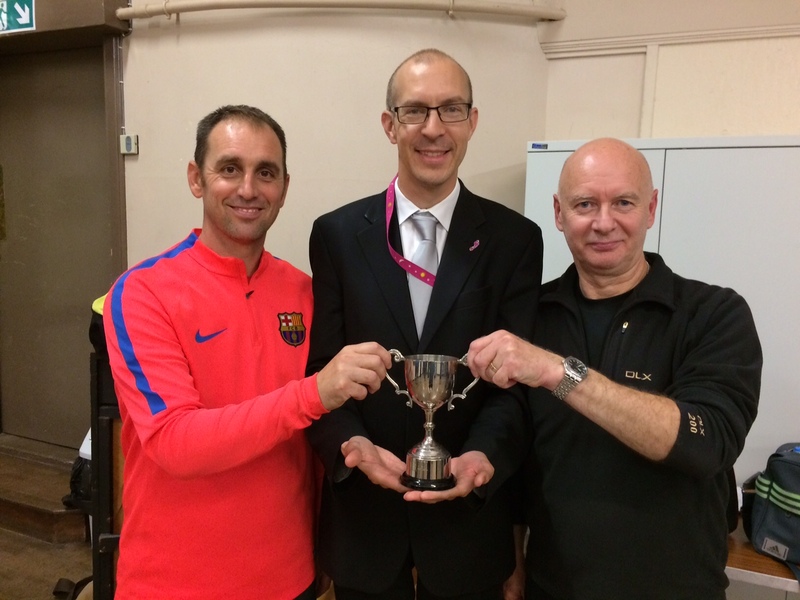 This entry was posted in Eglinton Trophy, Match reports, St Andrews Table Tennis Club on September 3, 2014 by standrewstt.